During the week 26-30 March 2012, the IPC Academy delivered the first two workshops of the Rio 2016 Excellence Programme in Brazil. The two workshops covered the development of the Paralympic Budget and the important topic of Accessibility. 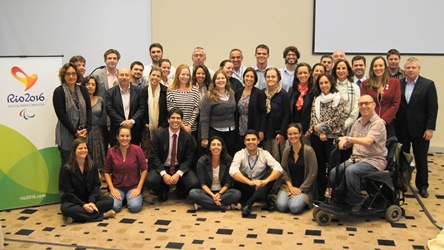 A number of experts presented throughout the week who engaged key staff from the Rio 2016 Organising Committee and its stakeholders', all key to the successful delivery of the Rio 2016 Paralympic Games. Head of Knowledge Management for the IPC, Apostolos Rigas commented; "this is the second edition of the Excellence Programme, following the initial programme for Sochi 2014, and we are delighted with the level of engagement and knowledge sharing that the organising committee and the their stakeholders showed during the workshops. The IPC is committed to providing continuous support for our partners in the host cities and it is important that we tailor our input in order that the outcomes of are maximised. The Excellence Programme provides a unique and well established platform for us to work with our host city partners on issues that are most relevant to the delivery of excellent Paralympic Games." The first two workshops are part of a four year programme of activities to transfer knowledge to Rio 2016 at the time when they can make most use of it and in a format that conforms to world best practice in management education. Mariana Mello, Paralympic Games Integration Manager for Rio 2016 stated, "the programme provided a great opportunity for us to discuss and learn from the valuable insights provided by experts. It also provided a unique opportunity for us to engage with our stakeholders who will share our journey on the delivery of what will be an exceptional Paralympic Games in 2016." The Rio 2016 Excellence Programme is an IPC Academy knowledge management initiative to assist with the delivery of specific knowledge in the context of the Paralympic Games organization.